On the back of this month’s earlier barrage of national team kits, the Swoosh apparently aren’t finished yet as they reveal the Nike France Away Shirt 2013 and – Sacre Bleu! It’s…well… bleu! “Innovation, performance and elegance have become key features of the French Football Federation uniforms since Nike began its partnership with the national team.” according to Nike, and without blowing their own trumpet, they’re not kidding. Every kit that Nike have made for the FFF has been absolutely exceptional – a run that’s continuing on the Nike France Away Shirt 2013. 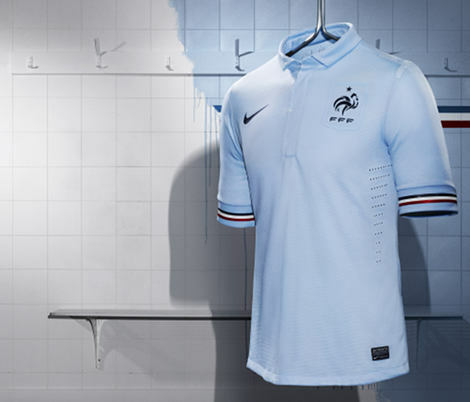 Rather than the white of previous kits, Nike have opted for a clean pale blue on the France Away Shirt 2013,' a colour that runs throughout the kit, with the shorts and socks designed in a matching hue to give a daring all-blue silhouette. 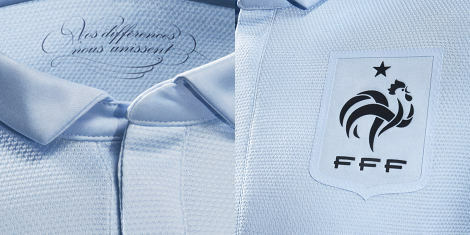 The shirt has a button collar and the iconic French cockerel crest. 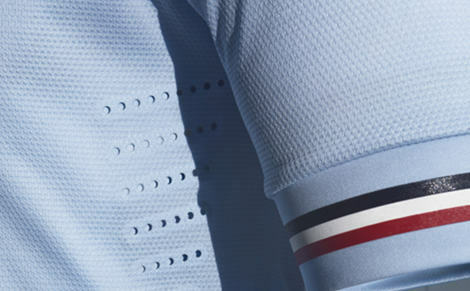 Both sleeves have a tricolore motif while another tricolore detail can be found on the right sleeve. The signature Ĺ›our differences bring us togetherĹĄ, found on the French national team kits since 2011, is printed in the inside of the shirt, just below the collar. Whilst not pictured here, the Tricolour trim also runs along the shorts, tying the whole kit together with a mixture of a new colour for the France Away' kit, and the pride and tradition of the French national flag. 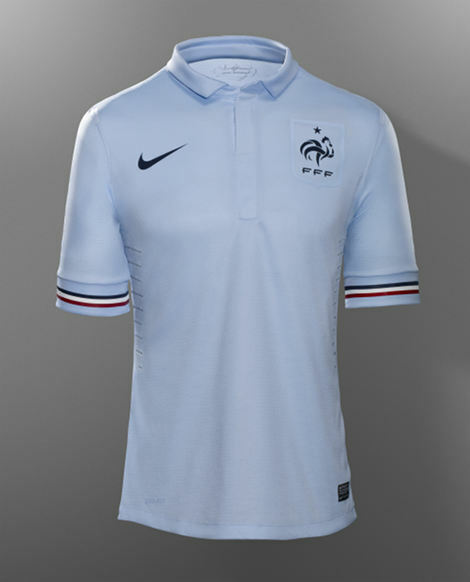 As you’d expect, the France Away Shirt 2013' is made in line with Nike's commitment to combining performance with lower environmental impact, fabric for the new kit's shorts is made with 100 percent recycled polyester, while the shirt fabric is made with a minimum 96 percent recycled polyester. 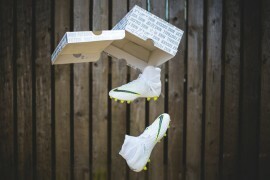 Each kit is made using an average 13 recycled plastic bottles. 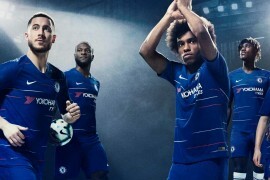 The kits are constructed using moisture-wicking' Nike Dri-FIT technology: the fabric’s knit structure' is 23 percent lighter and 20 percent stronger than Nike's previous kits. 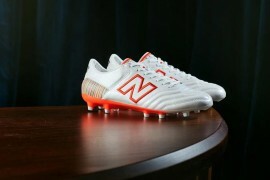 The French Female Football Team will be the first to wear the new kit on pitch vs. Brazil on March 9, and the men's team will follow on March 22 for their qualifying game against Georgia. Thanks to DDChile for posting this on our Facebook wall!